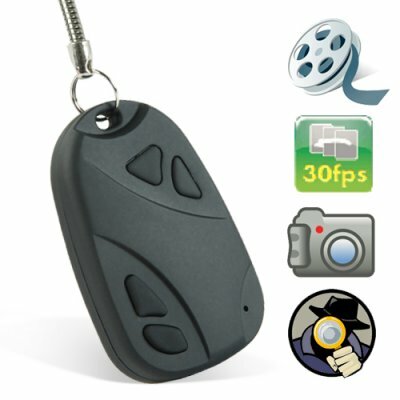 Successfully Added Digital Video Recorder Camera (Keychain Car Remote Style) to your Shopping Cart. 4GB DVR Digital Video Recorder Camera in a keychain car remote style casing. Coming in a compact form factor and presented in raven black, this discrete camera is disguised as a standard car alarm remote on a keychain. A DVR device with a concealed camera for recording motion video of your surroundings or unsuspecting people, the CVSD-J12 is a fantastic gadget that is easy to use. With its deceptively normal exterior and easy to place on flat surfaces, this is the perfect device for all aspiring secret agents! Effortlessly record high quality color video at 720*480 (VGA) resolution at 30 FPS for smooth playback - simply connect the device to your PC via USB to access your recorded footage. Coming with 4GB of internal flash memory, you can be confident of never missing any important scenes. Use this gadget to record hours of business meetings or interesting events on the sly. Stay one step ahead with this incredibly fun, discrete and unique digital video camera. The device can also be used as a standard high-quality DV and still camera for candid shots but in a highly convenient form factor. This fantastic gadget can also be used as a standard USB memory device to conveniently transport your important computer files - simply connect it to your computer using USB and copy your files over to it! This is a truly useful dual-function item that can be used by anybody, anywhere! Place it on your desk, on a shelf, in the background close by - it is the perfect covert device to record footage! Easy to use and practical, this compact and pocket-sized device has been designed with maximum portability in mind so it fits unobtrusively anywhere. This Camera is also a great portable video and photo recording tool for those people who work in the business, education, HR, security, media, press relations, tourism and related fields and may need to make quick, spontaneous video recordings. The CVSD-J12 is in stock now for your single piece or stock orders and is available exclusively from the number one wholesale source for surveillance cameras, Chinavasion. Press the on/off button for about 3 seconds, till the yellow LED light appears, so the item is turned on. Then press the record button for about 3 seconds, the yellow LED will flash 3 times then stop. This means the device is recording video now.and has entered recording mode. Press the record button again, the yellow LED light will appear again and the device will stop recording video and save the file. Turn on the device, the yellow LED will appear and be solid (not flash). Just press the record button once, the yellow LED will flash once to show that it has taken a photo. The image will be saved automatically. The yellow LED will flash once every time it takes one photo. Create a new Txt file on your computer named “SetTime”. Open the file, input the date and time in the following format: year , month, day, hours, minutes and seconds format (for example : 2009.05.18 18:28:23). Then save the text file, connect the device via USB and copy the text file to the root catalog of the device then disconnect the device. Then turn on the device again to record a video as usual; connect to the computer again and you will find the date and time have been changed to the one you had set. If this method does not work, please try formatting the device first, and then repeat the previous steps. Keychain very good handle, photo shoots and hits with very good quality. The keychain spy is very good, excellent quality and price is unmatched. Outside that Chinavasion is very reliable. It's a great camera that works fine in the optimal conditions, the resolution of the photos and video is awesome. If you want to record an event without anyone noticing it you should buy this. But be warned, you'll need skills to get a decent pic. I used this to record the moment when I gave the engagement ring to my fiancé, and it worked perfect, nevertheless I didn't got a nice angle with it... but the device worked properly. Recommended highly for its all black look and records well. Buona la qualita' , discreto audio ma è molto poco luminosa . In una stanza con luce neon la ripresa è scura.